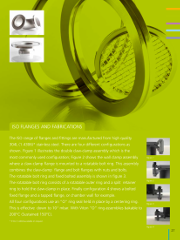 The KF range of flanges and fittings are manufactured from high quality 304L (1.4306) stainless steel*. 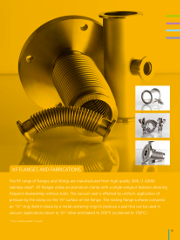 KF flanges utilize an aluminium clamp with a single wingnut fastener allowing frequent disassembly without tools. The vacuum seal is effected by uniform application of pressure by the clamp on the 15º surface of the flange. 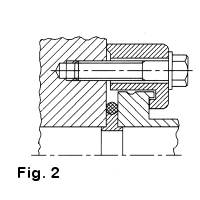 The mating flange surfaces compress an “O”-ring (held in place by a metal centering ring) to produce a seal that can be used in vacuum applications down to 10-7 mbar and baked to 200°C (sustained to 150°C). Download KF only catalogue. 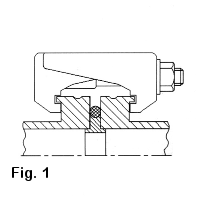 The rotatable bolt ring consists of a rotatable outer ring and a split retainer ring to hold the claw-clamp in place. 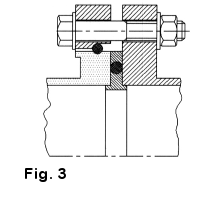 Finally configuration 4 shows a bolted fixed flange and a tapped flange, or chamber wall for example. 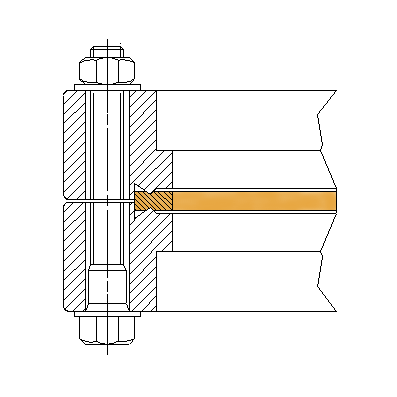 All four configurations use an “O” ring seal held in place by a centering ring. This is effective down to 10-7 mbar. 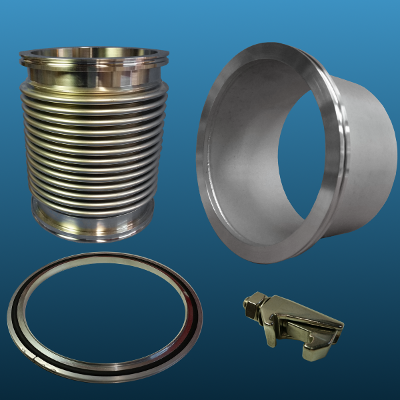 With Viton “O” ring assemblies bakable to 200°C (Sustained 150°C). * 316L (1.4404) available on request. All CF flanges are manufactured from specially selected, high quality stainless steel - 304L (1.4306) or the higher specification 316LN (1.4429). 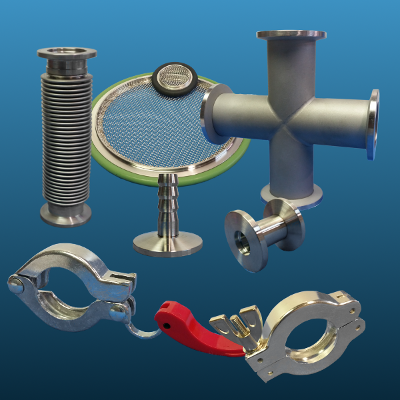 These materials being the accepted standards throughout the UHV vacuum industry. Both stainless steels are low carbon varieties designed to avoid inter-granular corrosion after welding. 316LN has the additional advantages of a lower magnetic permeability, harder knife edge, and high temperature H2 degassing at up to 950ºC. Full traceability is available on all materials used. Protective mouldings and suitable packing ensures that the flanges reach the customer in perfect condition for use on UHV equipment. 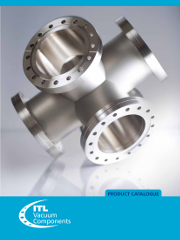 The product range includes blank, bored and rotatable flanges in all of the internationally approved sizes. Other sizes and special flanges are available to order. 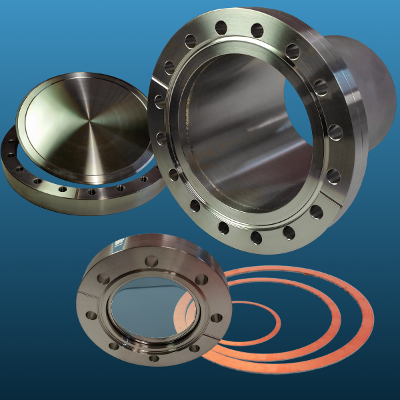 The CF series flange utilise the well proven captured copper gasket sealing principle which is now almost universally used in the UHV industry. 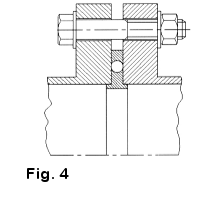 The seal - an OFHC copper gasket - is held between the knife edges of a pair of CF flanges. On tightening the retaining bolts, the knife edges cut into the gasket and force the copper both axially as well as radially outwards to the flange. The material is thus enclosed and cannot flow, even at high bakeout temperatures. This sealing method has a maximum bakeout temperature of 450ºC and is suitable for vacuum applications to 10-12 mbar. 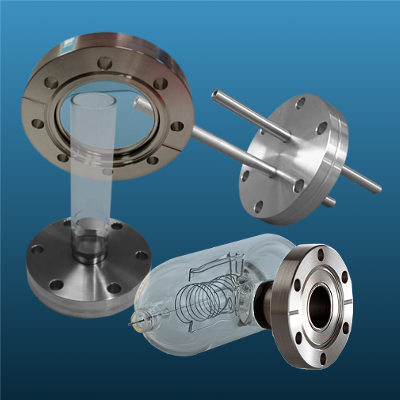 Glass encapsulated ionisation gauge heads, viewports, glass and ceramic feedthroughs. The rare glass working expertise is available as a resource to OEM customers. Magnesium Fluoride and special exotic material windows optimised for particular wavelength transmissions, plus anti-reflective coatings, can be quoted on request. 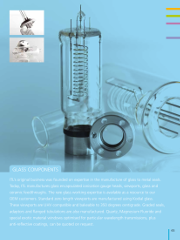 Download Glass Products only catalogue.